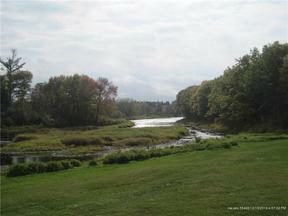 This outstanding waterfront property located in Southern Aroostook County has a mile of water frontage on Mattawamkeag River and a total of 232 acres. This is a great wildlife parcel with hunting, fishing and a natural beauty not available any longer. From the shoreline of this property you can see Woodchuck Island, Elm Island and Eunice Gut runs through the property and is bordered by Hawkins Brook in the southern portion of the property. There is approximately 132 acres of softwood , 43 acres of mixed wood and 7 acres of hardwood. Imagine yourself in the 1830's being one of the first settlers of Reed Planatation in the village of Wytopitlock paddling up the Mattawamkeag River with this almost untouched parcel of land. All information deemed reliable but not guaranteed and should be independently verified. All properties are subject to prior sale, change or withdrawal. Neither listing broker(s) nor Adams Real Estate shall be responsible for any typographical errors, misinformation, misprints and shall be held totally harmless.